Vegas goes RWB to a 4 pt major and Best of Breed puppy at the Mayflower GSPC Specialty held in conjunction with the Eastern Dog Club show. Tonka goes BOS in Sweepstakes at the Mayflower GSPC Specialty held in conjunction with the Eastern Dog Club show. Tonka goes Best in Sweepstakes at the Kahtahdin GSPC club Specialty held in conjunction with the Eastern Dog Club show. Vegas goes Best of Opp. In Sweepstakes at the Kahtahdin GSPC club Specialty held in conjunction with the Eastern Dog Club show. Crayola, Squall and Meadow qualify for the GSPCA VC (Versatility Certificate) Award. For more information Click Here. Honeybriar N MiKarma Beat the Heat “Breeze” qualified for her 2nd JH leg. Breeze was breeder/owner handled by Rich Mahoney. Vegas qualifies for the final leg of her JH (Junior Hunter) title at the Spinone Club of America Hunt Test. Vegas was once again handled by good friend Rich Mahoney of Honeybriar GSH Pointers. Thanx so much Rich!!!! Tonka qualifies for the Eukanuba Invitational to be held in Long Beach,CA. This honor was bestowed on Tonka by him receiving all of his championship points from the bred-by exhibitor class. Vegas qualifies for her third JH leg. She was again handled in the field by good friend Rich Mahoney of Honeybriar GSP’s. Thanx a bunch Rich. Vegas qualifies for the first two legs of her Junior Hunter title at the Spinone Club of America Hunt Tests. She was handled in the field by great friend Rich Mahoney of Honeybriar GSH Pointers. On Friday July 14th at the Grand River Kennel Club Show with a supported entry by the GSH Pointer Club of Ohio, "Tonka" MiKarma's One Little Indian, JH went Winners Dog for a four point major and Best of Winners (MAKING IT 5 POINTS)!!! To finish his championship!!!! Thank You judge Esther Joseph. 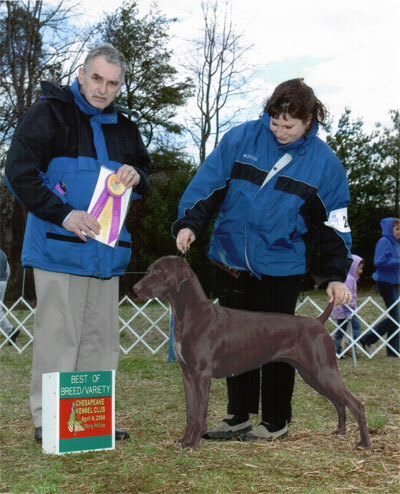 He also went best in sweepstakes that morning under fellow GSH Pointer exhibitor Dave Zavasky. Tonka earned all of his points from the bred-by exhibitor class and finishes two weeks after his first birthday. Tonka goes Winners Dog for a 4 point MAJOR!!! At the Northeastern Maryland kennel Club. Thank You judge Dana Cline. Tonka goes Winners Dog and Best of Winners for two more points at the Rock Creek Kennel Club under Judge Karen Wilson. Tonka goes Winners Dog for another point. Squall qualifies all three days In Rally to earn his Rally Novice title!!!! Tonka goes Winners dog/Best of Winners & Winners Dog for 2 more	points. May 2- Desert GSPC Host Specialty- Tonka wins the 9-12 puppy dog class under	breeder-judge Barbara Schwartz! May 3- GSPCA National Specialty- Tonka places 4th in the 9-12 sweeps class under breeder-judge Brenda Abraham. What an honor!! Thank You Keith Vooris for taking such special care of our boy and showing him to perfection for us. Eastern GSH Pointer Specialty, Crayola & Meadow both qualify for their final Rally Novice leg. Crayola received a 3rd place in the class with a score of 96.